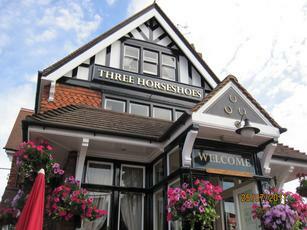 Went here yesterday as part of the "Brakspears Henley Ale Trail" . Although situated between two roads there is a large seating area to the front and side which is a bit of a sun trap for the evening sun. I was here around six o'clock and very pleasent it was. Good pint of Brakspears Bitter and HobGoblin. Very friendly Bar Staff and the Landlord is a Gem. Would like to have this pub as my local as it seems to be the centre of the local community, with something on most nighst (Monday Pool competition, Tuesday Darts competition etc.) Will definately be back again (Next week if I can arrange it). My recomendation is to visit as it is only a FIVE minuite walk from the Rail Station,. I use this pub regularly at lunchtime and really like it. The staff are friendly and the atmosphere is very cosy, despite the size. We actually started our weekend trip to Henley in this pub so, unlike Quinno, were sober when visiting and therefore can fill in the gaps. Yes this is a generic local a little way out of Henley on the Reading Road. I presume it was once a two bar pub but now knocked through into one large roomed place. It still keeps separate areas with there being a public type section supporting a pool table to the left of the bar as you walk in, and then a larger carpeted lounge area to the right which supports a wood floored dining area right at the end. And yes, there is indeed a flat screen tele in the lounge section. It�s a fairly standard back street boozer with no great redeeming features, but the lunchtime food we had could not be faulted and although we didn�t appreciate it at the time, the Brakespears Beers we had here were probably the best kept of the weekend. Quinno's epic Henley crawl ended here at the first pub many people see when they drive into Henley, a big building that straddles the split in the road as it forks. This is essentially a generic local, owned by and serving Brakspear - my Special was pretty good, one of the best of the evening. Not bad, would look in again.